If sowing directly, sow at a depth of approx. 0.23 inches (0.6 cm) and aim for a distance of at least 0.39 inches (1.0 cm) between Carrot plants. Ensure you have enough space in your garden for this plant - Carrot 'Marché de Paris' is known for growing to a height of approximately 15.0 cm (that's 5.85 inches in imperial). Your garden has indoor light - a full sun position will ensure your plant thrives. Your garden's USDA Hardiness Zone (8) is within the ideal range for Carrot 'Marché de Paris'. The recommended range is between Zone 3 and 11. Try to keep the ph of your soil between the range of 6.0 and 6.5 as Carrot 'Marché de Paris' likes to be in acidic soil. 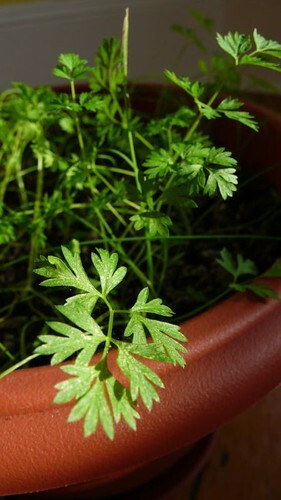 More information about Carrot 'Pariser Markt 4' is available in the Folia gardener's wiki. All Carrot 'Pariser Markt 4' Care Instructions have been kindly provided by our members. Nic – you’re right! Our carrots sure do look like long-lost twins :P Glad to hear that they’re starting to take off. Carrots in a container indoors! What a brilliant idea!